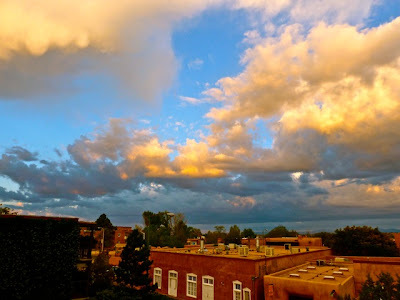 I watched the sunrise this morning over New Mexico from the window of our adobe hotel room in downtown Santa Fe. The storms skirted us all week, and the clouds enhance the orange light as it stretches from behind the fugacious masses, so unlike the clouds in a Rodrigue painting. 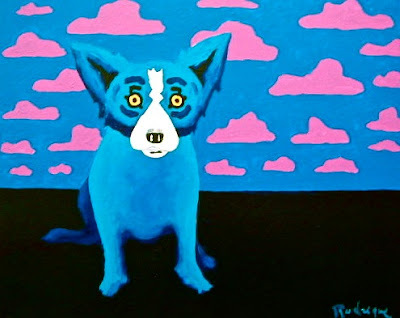 …I asked George Rodrigue, as we drove from Flagstaff, Arizona to Gallup, New Mexico and studied the sky. Behind us the darkness obscured the sunset so that the light jumped over the thunderclouds, causing an interesting sky in the East. Why didn’t you paint clouds in your Cajun paintings? I asked him. I knew immediately what he meant. Once he pushed the oak tree to the front of the canvas, the sky was full, and clouds would have muddied the composition. (for examples see any of the Cajun posts under 'Popular Musings' to the right of this essay). 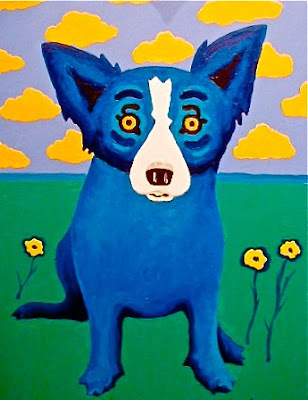 With the Blue Dog paintings, however, George paints clouds in the same way he paints flowers, with little connection to the real world. 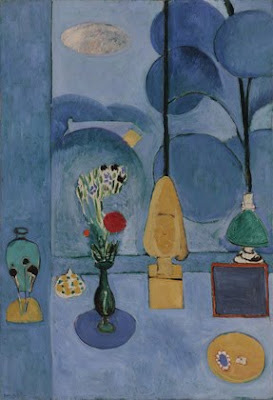 His clouds are simple and stylized, so that no element of the painting has more weight than any other. 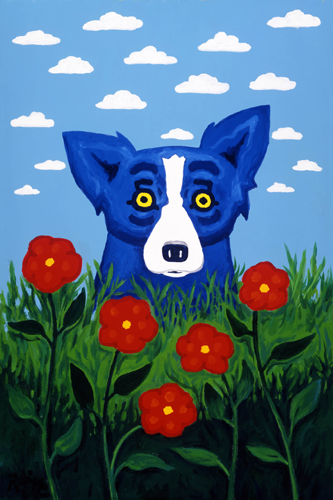 Whether Rodrigue’s Blue Dog or Matisse’s vase of flowers, the same can be said for every shape in the painting. No element, nor the space between the elements, is more important than any other. Because of the patterns and strong colors, George’s cloud paintings are far removed from the ethereal quality of a real sky. 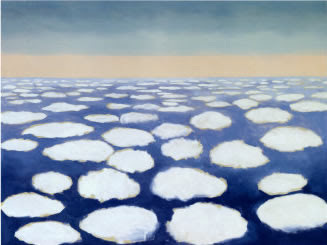 As an artist, his canvas changes with his moods, and these cloud paintings, twenty or so images between 1999 and 2001, have an almost child-like joy about them, while at the same time a studied control. 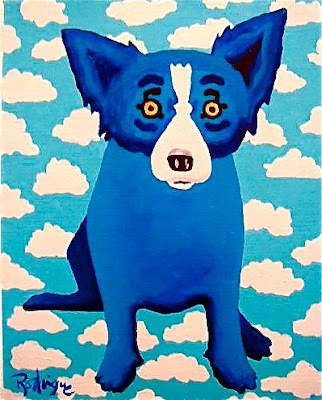 How different from his moody Landscapes of the 1970s; the fragmented Blue Dogs of post-Katrina; and the mysticism of Bodies, where the control, although still important, is subjugated to the concept or symbolism of the overall work. 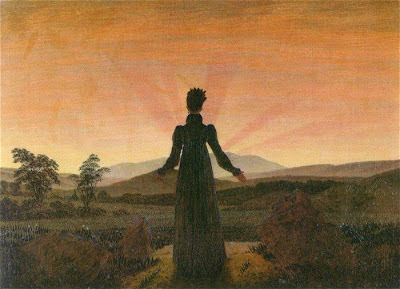 These mood changes are familiar to each of us within our own lives, and George is not the first artist to recognize the clouds as symbols of our transitory existence and emotions. With this essay in mind, George and I stared at the sky this week. We thought out loud about the wonders of nature and the challenges of painting it. We pulled off the road and studied the sky’s patterns and colors. We thought about the early Spanish settlers crossing these prairies for the first time. We vowed to reread together Death Comes for the Archbishop (Willa Cather, 1927) before our return visit this winter. And we reminisced: George talked about his early years in Santa Fe and the artist friends awaiting his visit (see the next post...). And I recalled my childhood, standing on the balcony on Okaloosa Island, dreaming about my future and, even at a young age, the meaning of life and relationships. 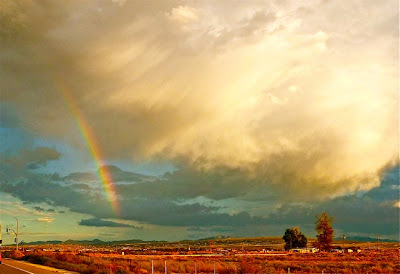 all photographs in this post shot by George Rodrigue in Arizona and New Mexico, October 2010; for our journey west, earlier this summer, see "America the Beautiful"
Thank you for moving me today! I can't explain it, but I am in love with your Blue Dog! I will own one, one day! The colors and the face are just wonderful! Love your work! Thank you, flashpointfarm! I'll make sure George Rodrigue sees your kind comments.